I started a MMM group on InspireSwapChat. Every other Monday we send our partner a themed item and a short letter about ourselves. This week the theme is our hometown. Of course I happen to reside somewhere that is sooooo easy to find product that represents our area. 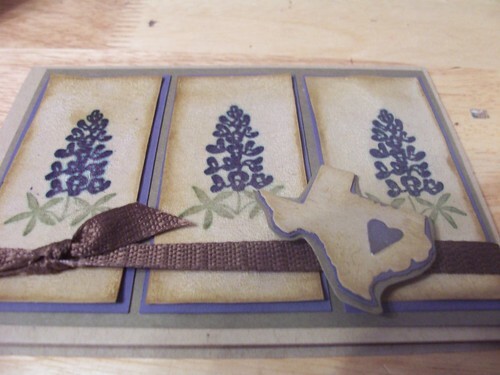 Basically if you shape anything like Texas, slap a bluebonnet on it or the Texas flag it will sell. On to my card... 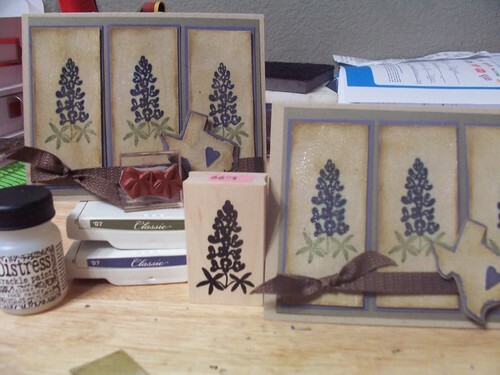 I started with kraft paper and a blue bonnet stamp. 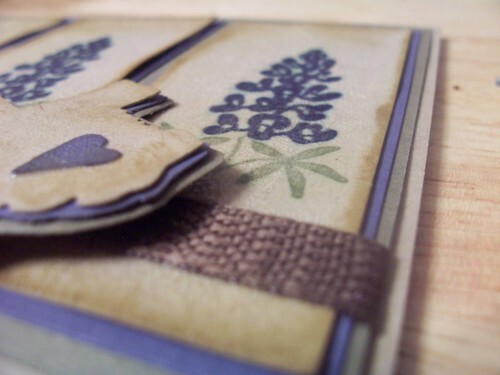 I started using the stamp but it was all one piece and a real pain to get the look I wanted so I pulled it off the block, cut it apart and then mounted the leaves with some tack it over and over so I could use it with an acrylic block. Presto! Perfect bluebonnets. I wasn't quite satisfied with the Kraft look. I wanted a more rustic feel so I dabbed on some Rock Candy distress crackle paint. That stuff is so awesome! It dries in about the same amount of time as stickles but gives a clear crackle look to your project. I finished up with the tea duo inks from Papertrey in the crackles and I had the look I was going for. I have started making "faux" knots on my projects. Rather than pulling the ribbon all the way around the back, I tape down each end of the ribbon to the back side, just over the edge, of the cardstock. Then I take a smaller piece of ribbon and tie a nice knot or bow anywhere I want to on the ribbon. I think it's easier to place it, uses less ribbon and if you knots and bows are not weight baring (meaning they hold the ribbon in place) you can get a nicer looking finished piece.